Why do we “re-release” our databases? Many of our databases are fully searchable throughout seven categories: first name, last name, year, record type, parents’ names, spouses’ names, and location. However, some of our older collections are not indexed with all of that information. Perhaps a collection is only searchable by last name and record type. Our wonderful volunteers work to transcribe images of the original material, creating a spreadsheet that does contain each of the seven categories to the extent that information is available in the original. Our volunteer coordinators, Marie Wells and Helen Herzer, assign work to the volunteers, collect it back, and proofread the spreadsheets as a double check. Back at NEHGS, we look over the spreadsheets a third time before uploading the new and improved information into our databases to be searched more easily by our users. Over the past month or so, we have re-released five sets of vital records from throughout New England. These collections of births, deaths, and marriages were all transcribed by passionate genealogists and record-keepers in the 1800s from original town records that were often in varying states of decay due to age or improper storage. 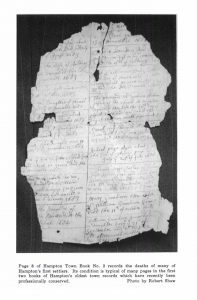 The work done by these early transcribers was difficult as they wrangled records in poor condition, illegible handwriting, and disparate information between town, county, and state records (and, often, discordant record-keeping practices). The introduction to the vital records of Hampton, New Hampshire (shown above) includes a striking image of one of the original town records which highlights the important work done by these enthusiasts in the 1800s. Their transcriptions allowed these fragile documents to be disseminated in book form so that information was not lost and many people could view and handle the records in a new format. Our databases now continue that mission of expanded reach and improved access for users as the books in turn grow old. Below are listed our newest improved sets of vital records along with the volunteers who worked on them. These are not all the volunteers who volunteer for the web team, but we hope to highlight more in future posts! Thank you Molly for thinking to give thanks for all of the volunteers on the day we celebrate our ancestors and family. Roger, what a neat thought that adds a layer of meaning to Thanksgiving. After reading your post, I realized that that is indeed what my family does at Thanksgiving: our conversations revolve around stories about at least the more recent ancestors. One way we keep their memory. Though I suspect a few tall tales sneak in there, that is part of our family history too. Yes, thanks to each and every one of you. Wish I could join you. I note that a “Pulsifer” is still involved in preserving NE records! I realized how much work goes on behind the scenes recently when I did a re-lookup on some of my ancestors and got many more hits than I had before. Some won’t lead me anywhere, but a few gave me some hints to follow up on- including a new possible spelling and geographical location for one of my more elusive lines. Thanks to all of you for making it possible for me to access records I might never have found otherwise. Makes me wish I lived closer, because I love indexing.